Today’s knitting pattern is a very unusual lace edging rescued from the advice column of the Melbourne Leader from 1884. 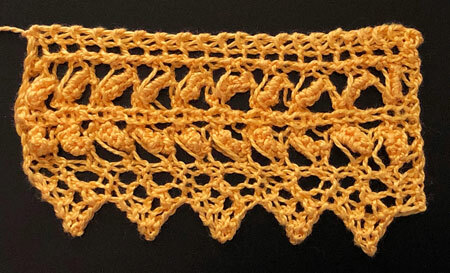 I’m a sucker for any 19th century lace edging that doesn’t have a picture of the finished lace, because they’re usually ignored or missed by modern knitters and are sometimes very special, like this one. Check out the knitting pattern for “Uncommon Lace”. I’ve updated, charted and test knit it so you don’t have to.